Those who had claimed that the TDP-Congress alliance was always going to split are today totally stunned. Not by the turn of events, but by how soon the prediction has come true. Even the worst doomsday forecasters are at a loss to explain what went wrong so early. But as one hack in Hyderabad sardonically put it, nothing went right in the first place for it to turn upside down later. The right headline is, he said with his tongue still dipped in acid, Congress breaks an alliance that never was. As matter of fact, the Congress and TDP came together by cobbling up a nebulous seat-sharing understanding in the Telangana elections last year. But the duo got a resounding drubbing, as the public rejected them and the ruling TRS, despite the anti-incumbency mood, triumphed spectacularly. “It was silly of the TDP to expect that the people would buy into an arrangement of convenience. As was repeatedly pointed out, his (Chandrababu Naidu) life-long politics was predicated on anti-Congressism. For him to go against the grain was suicidal,” says SK Sudhakar of Osmania University. At least in Telangana, the two parties could lay out a patchwork quilt and face the electorate, but in Andhra Pradesh the tie-up seems to have come unstuck right at the start. “That the announcement to go it alone in Andhra Pradesh has come from the Congress is bound to rankle Chandrababu Naidu,” adds Sudhakar. And in touchy Andhra politics nobody really forgives a snub. Remember it was Naidu who was the first to personally call on Rahul Gandhi and kind of set the ball rolling for him. But now the Congress has shown his party the door, and he would be hurting deeply inside. But for the Congress to take such an unilateral stand is also puzzling. For, it is not in a position of great strength in the 175-Assembly and 25-Parliamentary-seated Andhra Pradesh. So if the Congress was forced on this path, then the problem must have been really unsurmountable. 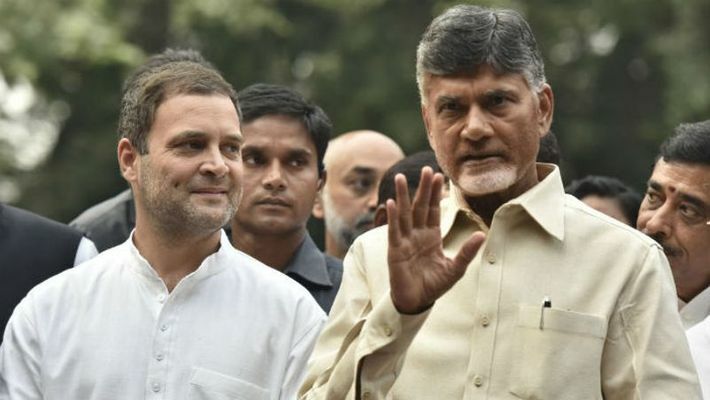 The Congress-TDP disconsonance also carries larger ramifications, as it will make the road tougher for Rahul in his dream to cobble up a strong alliance to take on the NDA (BJP). That Rahul did not make it to Kolkata for the Opposition rally is in itself a pointer to the shaky state of affairs. And leaders like Mamata and Naidu have their own ambitions to pursue. Worse, Naidu feels back-stabbed now. All in all, the echo of the happenings in Andhra Pradesh, when it is heard in Delhi, may not sound soothing to the Congress.